No Fenders -Formula 1, IndyCar and A Whole lot more..: Esteban Gutiérrez joins the Mexican F1 Drivers Hat dance! Esteban Gutiérrez joins the Mexican F1 Drivers Hat dance! I first heard about Esteban Gutierrez 'Wayback in 'Twenty-oh-Eight when he came to prominence in the since discontinued Formula BMW European (Europe) series, having won that years FBMW European series title; yet having been beaten in that year's Formula BMW World Finals championship by Alexander Rossi and 'Dane Michael Christensen; with America's Rossi being victorious overall on Gutierrez's home soil, in Mexico City no less after Esteban had started from Pole. Esteban, like almost all aspiring racing drivers began his career by competing in Go Karts, having begun in the Mexican Rotax Karting series in 2004, (at the age of 13) steadily progressing forwards before making his single seater debut in 2007. Joining the Formula BMW USA series, Gutierrez made an impressive debut by finishing runner-up to 'Kuhnadiun racer Daniel Morad, who'd begun his Karting career six years prior to Estebans - as the young Mexicali piloto won four races and scored nine poles in his debut Formula BMW season where he claimed Rookie Of the Year honours. For '08 Esteban switched to the Formula BMW Europe Championship where he romped home to the season title on the back of seven victories from 16-races - before finishing third overall in his last ever FBMW race at the aforementioned World finals in Mexico City. For 'Twenty-oh-Nine Gutierrez moved up to the Formula 3 Euroseries where he joined the reigning champions ART Grand Prix squad and was part of an All Star quartet which included future Formula 1 drivers Jules Bianchi (Marussia) and Valtteri Bottas (Williams) ironically the trio all being F1 Rookies in 2013 while his other teammate was Adrian Tambay, whose last name should sound familiar to Y'all Diehard F1 Aficionados; Can you say Patrick Tambay? 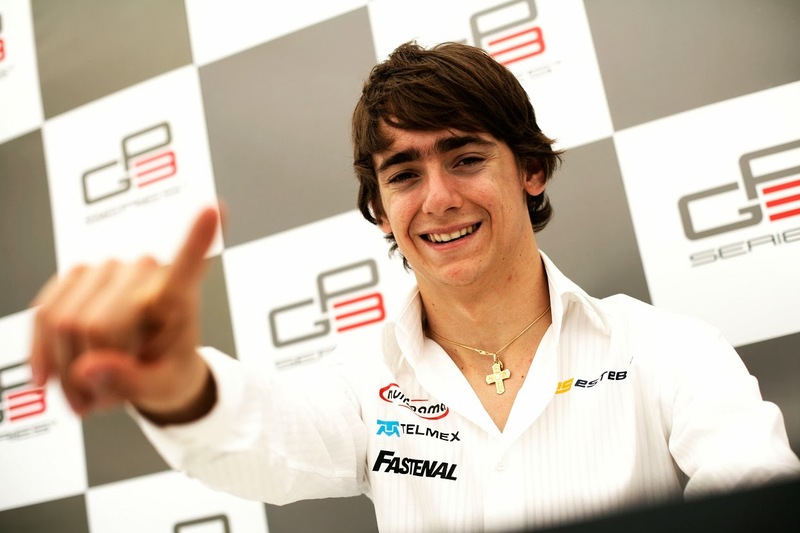 The following year Gutierrez graduated to the newly created GP3 series, once again with ART Grand Prix where one of his teammates was rival FBMW competitor Rossi, this time seeing the Mexican driver come out on top by winning the inaugural GP3 championship with five wins, eight podiums out of the 16-races before graduating to GP2 in 2011 with the re-branded Lotus ART outfit where he partnered with Jules bianchi. For winning the '08 FBMW Europe championship, Esteban, like all BMW championship series winners was awarded a test drive aboard one of the then BMW Sauber F1 Team's Formula 1 mounts - seeing Gutierrez getting his debut test in December, 2009 at Jerez during the F1 Young Drivers test alongside his FBMW nemesis Alex Rossi. For 2010 he first became an Observer at Sauber; NOT to be 'Cornfuzed as a "JAFO," i.e. ; "Just Another F%%KING Observer;" Hya! Which probably had something to do with his association with the Telmex Young Talent Academy; eh? Before being named as the team's official Test & Reserve Driver later that year. Along with continuing on in this role, Esteban also participated in both the 2010 & 2011 F1 Young Drivers test sessions before finally landing a coveted seat in Formula Uno for '13 upon his third place GP2 series finish where he's currently partnering second-half season German standout Nico Hulkenberg. And although Gutierrez's debutant F1 season has started off slow, he's come on leaps 'N bounds after the summer break, partly due to Pirelli's redesigned tyres - having finally scored his maiden Grand Prix points with a fine seventh place finish in Korea.